With the success of our eShopCCC solution and to better meet the demands of our customers, we have added new features available as options. The eShopCCC pack seems to appeal to both restaurants and snacks for which the tool was originally intended. The new options therefore address traditional restaurants, who would like to expand their field of action with takeaway or deliveries while complementing their on-site catering capacity. With the first option, the website is able to take reservations, and notify the person in charge of the establishment. The tool will take into account the opening days of the restaurant and will only offer bookings for the corresponding days. The tool allows the manager to spend less time on the phone and better organize his schedule. To avoid orders during the shot, the second option allows to apply schedules to the online store. These times may be different from those of the shop. Thus, the restaurant can accept orders before the service, then block them during, in order to focus on the room. A desire to modernize your restaurant? 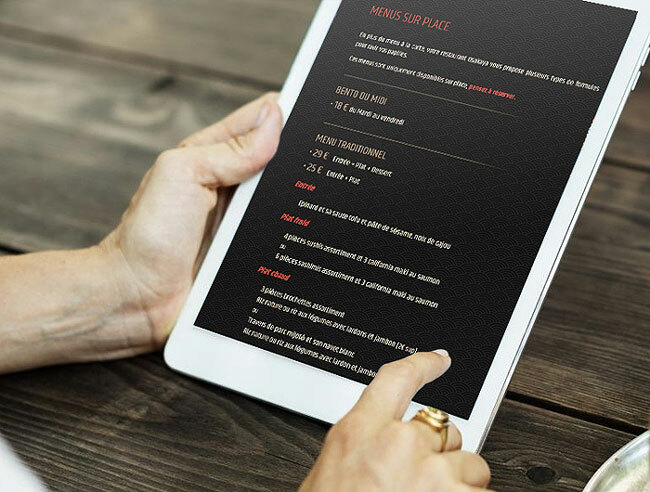 Opt for the menu on tablet! From your site's admin interface, manage your map, menus, drinks, and enjoy an optimized tablet presentation that will impress your customers. But we do not forget snacks and fast food restaurants. In order to further optimize take-away sales, we suggest adding a sales point to your shop. Once the order is placed by the customer, you will receive the ticket automatically at your UPOS point of sale, the connected cash register of our partner Ultimasoft.